But it's not easy when everyone is juggling busy schedules and convenience food, such as fast food, is so readily available. Here are some ways to incorporate all five strategies into your routine. In addition, family meals offer the chance to introduce kids to new foods and to act as a role model for healthy eating. Keep mealtime calm and congenial — no lectures or arguing. 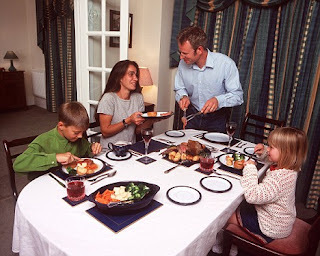 What counts as a family meal? Any time you and your family eat together — whether it's takeout food or a home-cooked meal with all the trimmings. Strive for nutritious food and a time when everyone can be there. This may mean eating dinner a little later to accommodate a child who's at sports practice. It can also mean setting aside time on the weekends, such as Sunday brunch, when it may be more convenient to gather as a group.